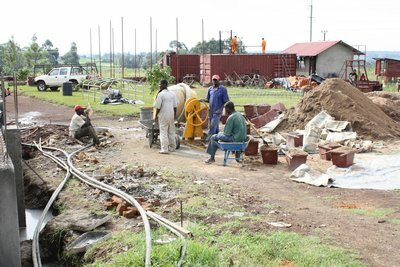 On the right you can meet our new member of staff: Fred, he takes care of the compound. 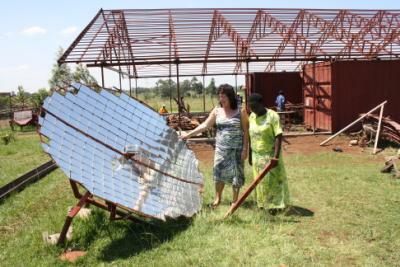 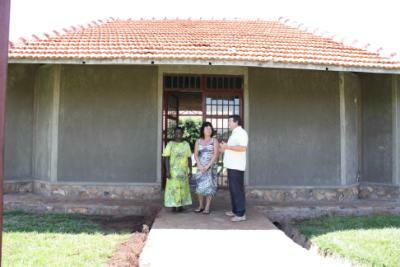 Marrianne Zeldenrust came for a work visit to see how the project is growing and discuss the plans for 2011. 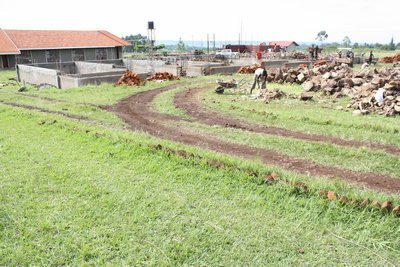 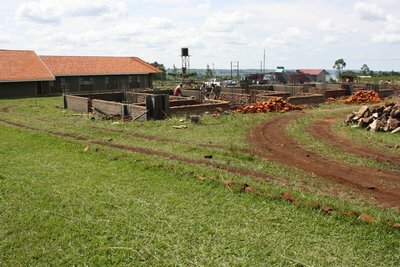 Below is the site where the visitors will get their rooms so this next visiting season they will be staying in the children’s village. 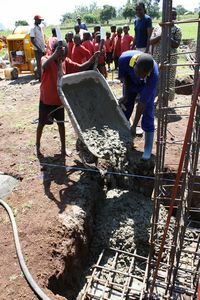 The builders are going on with the concrete bars for the columns while waiting for the drivers to fill the rest of the foundation with rocks. 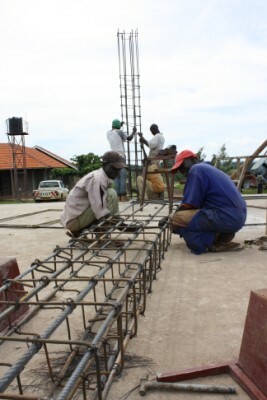 In the meantime the workers are roofing the workshop. 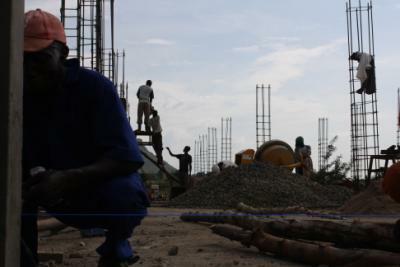 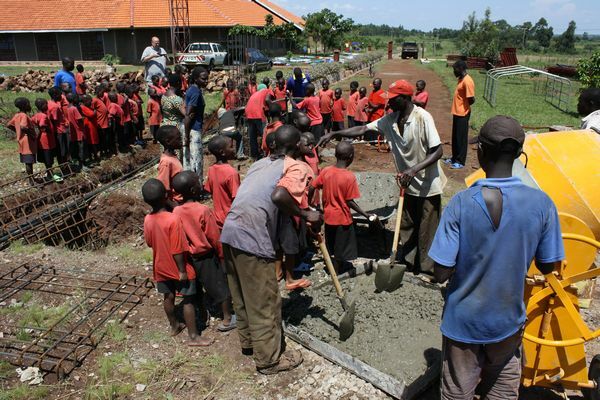 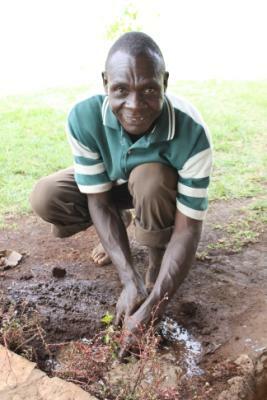 Something we should have done right at the beginning of the project but by then we just didn’t have the funds.Soon the boys can work in the shade because working in the Tororo sun is rather HOT!. 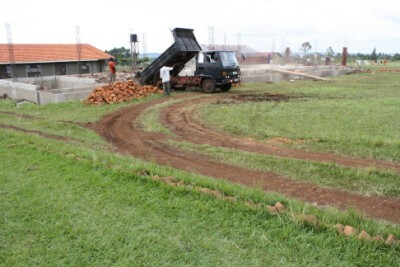 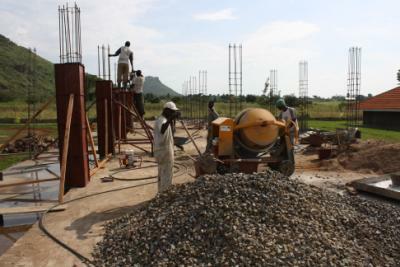 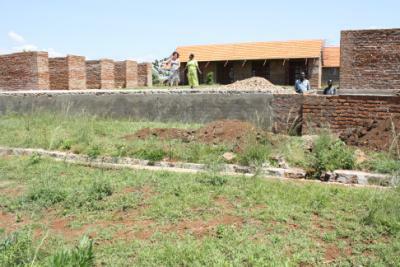 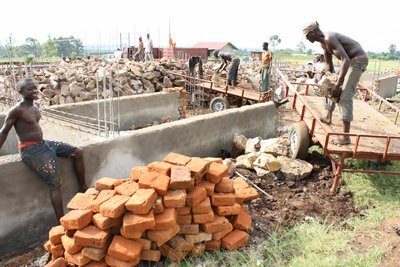 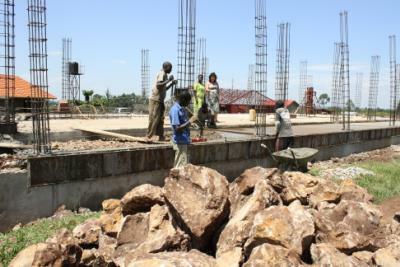 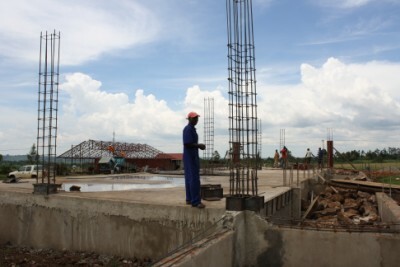 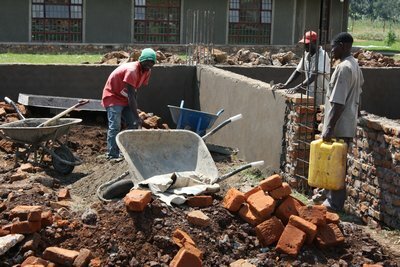 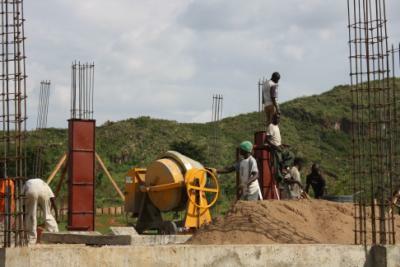 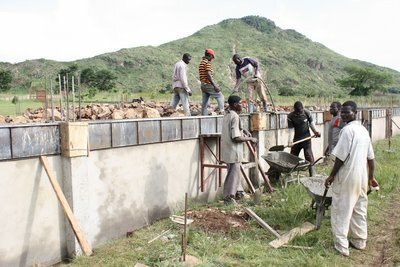 Wk 41 – 2010: the work on the 1st classroom block continues. 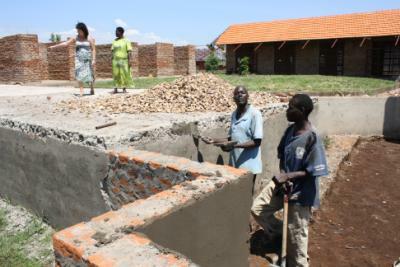 Below you can see Riend de braal helping with some plumbing work. 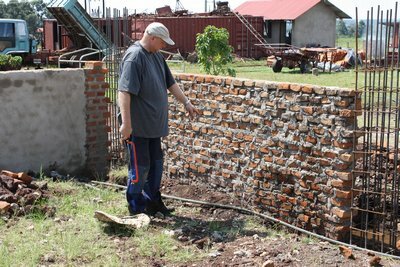 Some pipes have to be removed before we can start piling rocks in the foundation. 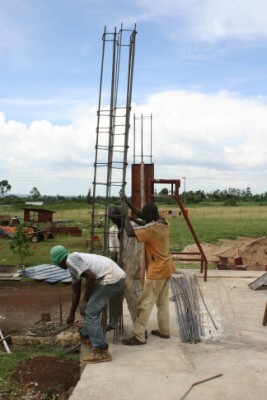 All column-footings are casted, the work is now focused on the walls of the foundation. 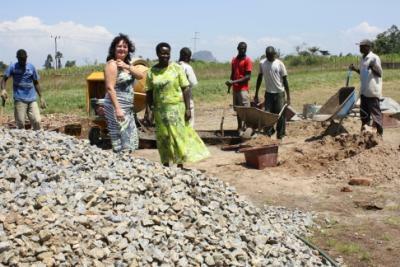 In the meantime the driver has to transport 140 truckloads of rock to fill the space up to the ground floor of the first block. 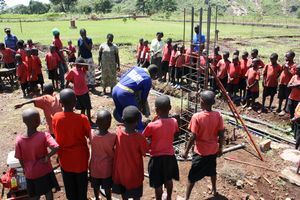 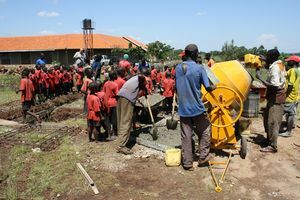 Today, we had the pleasure of coming together with the complete team, the builders, children, staff and leaders of KIMBILO Children’s Village – Osia and not only witness, but also contribute to the casting of the first column of the classroom block for the primary school.We asked the children: “what do the people who don’t know Jesus do on a moment like this?..” They all answered quickly that they kill a child to put under the foundation!! 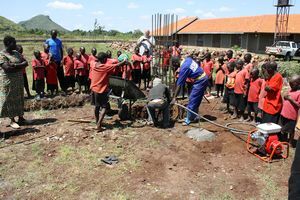 And indeed, that is what many people do who put their trust in the witchdoctor rather than the Living God.We prayed, sang and were happy that we know that these children will be protected and will end up being a student in this very building.